Anodyne takes place in the haunting, vibrant subconscious mind of the game’s protagonist, Young. You are tasked with navigating the various natural, urban and abstract environments within Young’s innermost self to help sweep away demons, defeat enemies and solve Young’s personal puzzles with their only weapon, a trusty broom! Clear out the dungeons, meander through Young’s own mind, and collect cards to advance further into the game as Young grows in confidence and ability. Defeat the evil Briar who is trying to transform Young’s subconscious into total darkness. Already launched on PC and Mac, this debut game from the 2-person studio Analgesic Productions was released to critical acclaim. Developed while the two were still students, Anodyne won an Honorable Mention at the IGF Student Showcase in San Francisco. The console version of the game has stayed mainly true to the original with added Achievements for PlayStation 4 and Trophies for Xbox One. 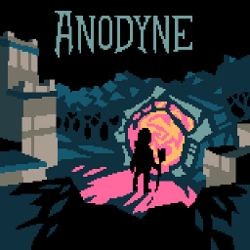 Anodyne will be priced at US$9.99 and €9.99. Regional prices may vary per platform depending on store conversion rates. Please check your store for full price details.